Waldorf schools offer a rich curriculum for middle school students. Students at this age are engaged and intrigued by the study of Roman history including; the construction of great buildings, roads, aqueducts and cities, the destruction of indigenous cultures and the period of the Dark Ages. Cultural, physical and world geography are explored in addition to the Roman and medieval studies. The sixth grade Waldorf curriculum provides ample opportunity for the students to hone their critical thinking skills. Strict observation in the science curriculum and exact thinking in their studies of geometric figures require the student to use these skills. An introduction to physics in the sixth grade, gives students insight into the properties of acoustics, optics, heat, magnetism and static electricity. Astronomy is taught as a series of observations of the movements of the sun and planets, visible constellations, and the moon phases. Mathematics lessons are designed to give the students’ real-life experiences of the world through principal and interest calculations, percentages, profit/loss calculations, ratio and proportion, and estimation. Pre-algebra is also an important part of the math curriculum. In world language and grammar lessons, students are introduced to business letters and more formal elements of grammar: declensions, sentence structure, punctuation, prepositions, active and passive voice, etc. Music studies proceed with individual and ensemble recorder playing (soprano, bass and tenor); orchestra and ensemble work; and singing using complex harmonies and minor keys. Fine and practical art lessons now include making patterns and sewing stuffed animals, painting and form drawing. In physical education, the students have an opportunity to play competitive sports, such as baseball and basketball. 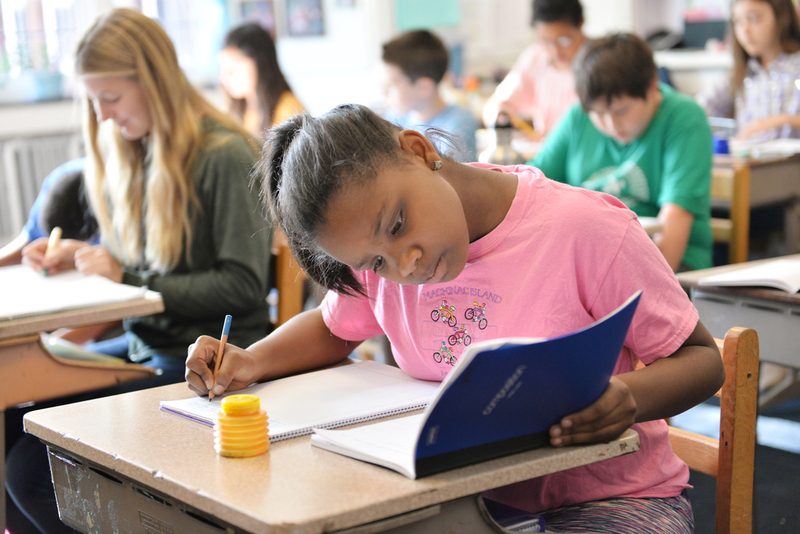 Seventh grade is a time for students to assert their independence and to find their place among their peers. What better time to study the Renaissance and the famous individuals in history who made their mark in science and art? Students have their first creative writing and poetry block as well as studies of literature and biographies. The physical sciences are taught in seventh grade. Mechanics begins the physics block with the discovery of the lever principle in relation to the human arm. This block extends to the basic mechanical principles applied to ancient and modern machines. Other topics in physics are the laws of refraction, reflection, heat and electricity. During the chemistry block, the students observe the properties of substances, acid and base qualities, and the way in which they inter-relate. Combustion is a theme that leads into the study of physiology and the life processes. Astronomy continues as observation from the earth of solar, lunar, planetary and stellar phenomena. The mathematics curriculum is very demanding. Students must come to understand negative numbers, algebra and plane geometry, graphing, roots, powers and formulas. The geography curriculum includes studying the explorations of the New World by European explorers. In addition, students study climate, tides, and weather changes. The world language curriculum includes grammar skills, reading and sophisticated conversation. Greek and Latin studies are incorporated into the grammar blocks. The fine and practical arts encompass sewing, sculpture, pottery, and perspective drawing. During music class, students will participate in chorus and orchestra while studying musical styles, such as madrigals, ballads, opera and oratorio. Finally, physical education will include team games, sports, and gymnastics. Eighth grade students stand at the brink of adulthood as they prepare to graduate from Detroit Waldorf School. Our graduates continue their education at prestigious high schools all over the region. Teachers strive for students to have the knowledge and confidence to face the next level of challenges as they complete their elementary years. The eighth grade history curriculum covers the Age of Exploration; the Age of Reason; the French, American and Russian revolutions; and the modern civil rights movement. Studying such biographies as Napoleon, Lincoln, Jefferson, and Martin Luther King brings alive the ideals for which these leaders fought and died. Students study the industrial revolution and the accompanying social changes. Themes in geography also give a comprehensive world-view of the economic interconnectedness of human cultures through the use of plant, animal and mineral resources. 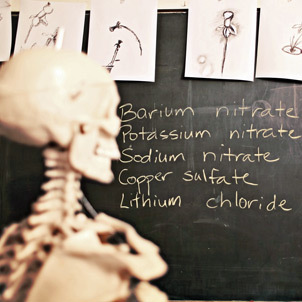 The science curriculum covers anatomy, specifically the skeletal and organ systems, and organic chemistry, with an emphasis on the processes of photosynthesis and digestion. Topics in physics include hydraulics, aerodynamics and meteorology. Through the principles of mechanics in the steam engine, the students learn how modern knowledge of technology led to the industrial revolution. In mathematics, students will continue the study of algebra and plane and solid geometry, with an introduction to surface area and volume. Graphing linear equations is introduced, along with the principles of the Fibonacci sequence, the Golden Mean and the five Platonic solids. Literature and writing for eighth graders concentrates on the theme of human freedom through the short story. Students normally stage one of the Shakespearean plays before their graduation in the spring. Latin studies will continue, as well. In language lessons, the students will undertake the study of poetry, verse and metric forms. Fine and practical arts studies include portrait and landscape painting; charcoal drawing, with an emphasis on light and shadow; sculpture; clothing construction on the sewing machine; and carpentry. Students will continue their instrumental music in orchestra and take up Elizabethan songs, spirituals, and other forms of American music. In physical education, students will continue team sports and gymnastics.